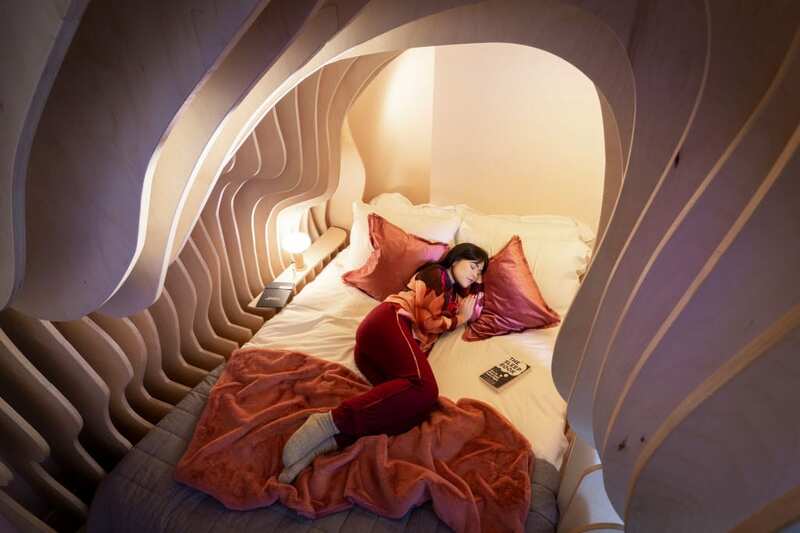 Designers have dreamed up the ultimate boutique getaway to help guests quite literally sleep like a baby on their travels – a bedroom that resembles a womb. Experts spent nine months meticulously developing the state-of-the-art apartments which feature a ‘Woom’ bedroom with a cocoon-like bed, inspired by the safety and snugness of the womb. With muted lighting, soft pink walls and high-tech mattresses, each ‘Woom’ bedroom within The Zed Rooms has been designed to encourage positivity, relaxation and REM-rich sleep – the type of slumber which promotes learning and creates dreams. Engineered for optimum slumber away from home, the innovative apartments are a collaboration between sleep technology company, Simba and design-led serviced apartments Cuckooz, and are available to book in London’s Tech City, Shoreditch. During the last weeks of pregnancy, a baby increases its consumption of REM sleep, hitting a lifetime high of twelve hours a day in the final week before birth. There will be no other moment during a person’s life when they will get such a huge volume of REM sleep. Radiating the security and snugness of the womb, the state-of-the-art bedroom design aims to help mute the brain’s ‘red alert’ status it develops when sleeping in a new place. Using insights rooted in the science of sleep, The Zed Room apartments have been designed to engage with every sensorial touchpoint of the body, creating an entire ecosystem that helps you to sleep from the moment you step through the door. The furniture’s rounded edges and softened corners mimic the sensation of bed, while rocking chairs are on hand to lull you into a relaxed state of mind. There are bespoke sleep recipe suggestions, rich in serotonin, melatonin and tryptophan, created in partnership with celebrity favourite, Detox Kitchen. Featuring restorative scents and colours that relax muscles, invoke calm and mimic the moonlight; air cleansing soporific plants to eliminate toxins and healing background harmonies to unwind. Each apartment also comes complete with yoga mats and meditation sessions via the iPad’s Calm app. The second bedroom is also designed for dreaming, draped with luxurious ethereal fabrics and artwork to transport the mind.